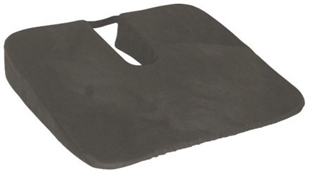 Firm foam seat wedge with coccyx-cutout for tailbone relief. Quality Ultrasuede covering with non-skid bottom. Gentle taper from 3" to 1'. 16"W x 15"D x 3"-1"H.